The Campbeltown Heritage Centre gives visitors a fascinating insight into the life and times of Campbeltown and the people who lived here. 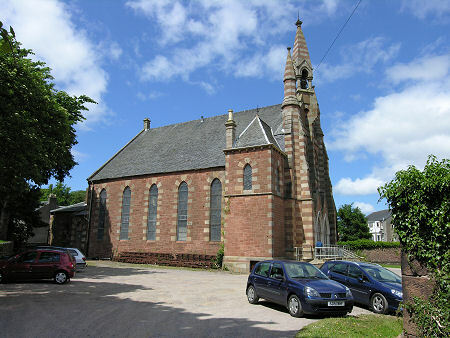 It occupies the former Lorne Street Church and stands on the evocatively named Big Kiln Street, which leads west from the centre of Campbeltown towards Machrihanish and Southend. The Lorne Street Church was built in 1868 to bring together the congregations of the former Gaelic Free Church and English Free Church, which had both jointly stood on this site. The architect was James Boucher of Glasgow and it is said that he was inspired by a church then recently built in Manchester by the leading Gothic architect of the day, E.W. Pugin. The highly unusual stripy pattern that emerged from the use of differently coloured bands of stone, especially on the east front, rapidly led to the church being known as The Tartan Kirk. 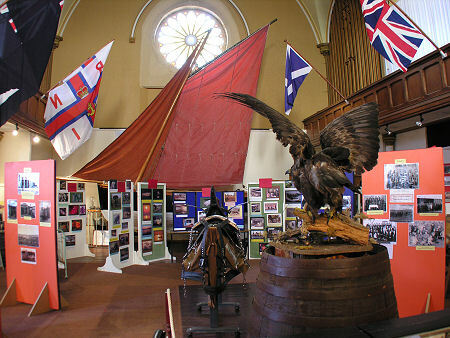 The church was closed in 1990, and since 1995 has served as home to the Campbeltown Heritage Centre. Open from April to September, the Heritage Centre is a great starting place for anyone wanting to gain an understanding of the sometimes complex historical background of what you see today in Campbeltown, and in southern Kintyre more widely. 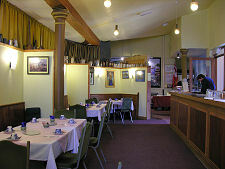 And as well as the wide range of exhibits on show, the centre is also home to a cafe. 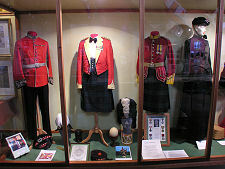 The Heritage Centre approaches its subject matter in a number of different ways. Throughout the centre there are display stands carrying historical photographs and illustrations, together with explanatory texts. In this way it sets out to explore and explain the key themes that have influenced the area: farming, fishing, distilling, mining, and the military. Some of these themes are also addressed by the the centre's best features, its range of superbly made and very large models. 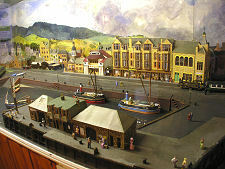 It is possible to spend a long time simply drinking in the amazing detail of the model of Campbeltown Harbour in the early 1900s which you encounter near the finish of your tour, complete with elements of the little known Campbeltown & Machrihanish Railway. 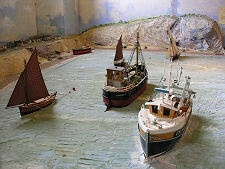 Not far away, a large seascape diorama is home to excellent models of some of the fishing vessels that have sailed from Campbeltown over the centuries. The centre is also home to a large number of evocative artefacts. Perhaps the most striking is "Yerda", a complete Lochfyne Skiff in full sail which dominates the west end of the main hall. This is typical of the sort of vessels that would once have been in common use by Campbeltown's fishing fleet. 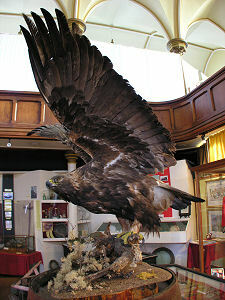 Other exhibits range from a collection of military uniforms dating from 1880 to 1940 to a mounted Golden Eagle with its wings spread as if about to take off. It is with mixed feelings that you read that up to 10 pairs of Golden Eagles once bred in Kintyre, the number being reduced in recent decades to 4 pairs by the replacement of their natural habitat with extensive forestry plantation. 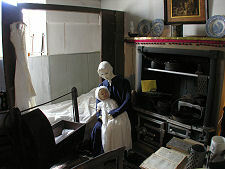 Also in the heritage centre are several recreated rooms designed to bring together artefacts associated with particular aspects of Campbeltown life. 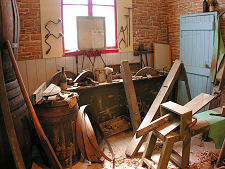 Especially evocative is the re-created cooper's workshop. In all, some 34 distilleries were established in Campbeltown, or Whiskyopolis as it was sometimes called, with as many as 25 operating at any one time in the mid 1800s. Coopers were therefore a very important part of the local economy. 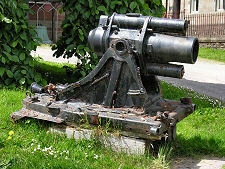 In the grounds of the heritage centre are a number of other exhibits, including a naval gun, agricultural machinery, and a large bell.